Our people are at the heart of our reputation. They're central to our ambitions. We aim to attract, select, train, reward and keep the most outstanding individuals and team members. We grow and develop as a company because each of our people seek, earn and retain the highest customer respect. As a result, our customers draw our business forward. From our depots in Tauranga and Taupo, we provide crane hire, transport and drilling rig logistics services to the Bay of Plenty and Waikato regions. We intend to develop our reach wherever we can add to our customer service. 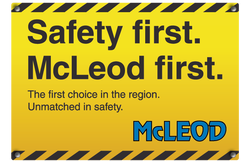 With this staff and customer focus, we work as a team at McLeod. We expect every one of our people to support, encourage and assist other team members. For our part, we aim to provide and facilitate industry-leading standards of training and professional development. If this sounds like a company you'd like to work with, we invite you to contact us. To be absolutely honest, self-motivated, and serious about safety. Interested? Please either email or fax this completed application form along with your CV and qualifications to us. Click here to Email or you can fax us on 07 574 2376. Have Sound understanding of diagnostics? This is a great opportunity to join an existing company as it expands in the Bay of Plenty. Interested? Please either email or fax this completed application form along with your CV and qualifications to us. Click here to Email or you can fax us on 07 574 2376.